Live, Love, Laugh and RENOVATE! : Happy Concrete oops Thanksgiving Weekend! This weekend Rona had a scratch and save event where you could save 10-50% off your entire purchase. We figured we needed about 40 bags of concrete for the basement... since each bag is 66 lbs and our pour little Matrix could only carry 10 bags at a time it meant I spent my day driving back and forth to Rona to get the concrete. BUT it was totally worth it because we ended up getting 20% off the concrete which put it at about $120 for the concrete which was a LOT better than what we had budgeted for at around $500 (that was for someone else to come and pour the concrete for us). So I spent my day driving back and forth to Rona while Ryan and Dave worked on forming in the basement bathroom. Since we had dug well below the foundation of the house (something you shouldn't do if you are digging out an entire basement... but when digging out a small room it isn't a huge deal). And since we wanted a shower in the basement bathroom that you didn't have to kneel in without hitting your head. We had to do concrete forms all along the walls of the bathroom for support. Ryan and Dave worked on creating the forms with extra wood we had lying around so the concrete would set in the shape we wanted it. Then it was the hard task of mixing the concrete and putting it into the forms. This literally took them ALL DAY and they were both exhausted at the end of the day! Carrying 40 66lbs bags of concrete is enough of a workout let alone mixing 18 bags of concrete for the forms!!! There was little I could do other than to pick up the concrete from Rona. Here is the progress we made! I know it doesn't look like much but its VERY exciting!!! 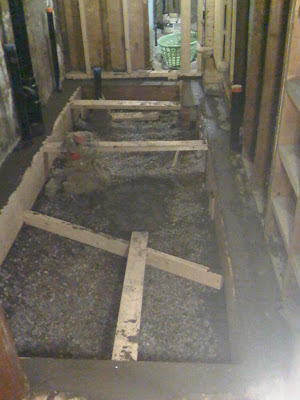 Once the concrete dries we will remove all of the wood so it will just be the concrete forms. Next step is to pour the concrete for the floor and then the plumbers will be coming back out to finish up the drains etc. 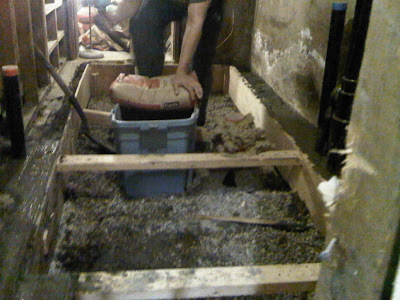 It was HUGE progress on this project, one step closer to not having a muddy basement!!!! Plus while at Rona I picked up some new flooring for the kitchen/hallway and nursery which I'm VERY excited about... but you'll have to wait until later on this week for that post!